On the eve of NBA All-Star weekend, Shaq and Kincade debate an article that popped up this week regarding current NBA players and their probabilities to get into the Hall of Fame - and the debate gets heated! We debut a segment of insane news about men doing stupid things called "Keep it in Your Pants," including a surprise guest appearance by Zoo Miami's Ron Magill. Kincade presents an edition of "White Moments in Sports," we get Borderline, and we play a round of the no-word karaoke game "Shaqeoke." Get into the mix on Twitter by following @Shaqcast or using #Shaqcast - follow The Big Podcast with Shaq on Instagram and Facebook - or send your best clips and questions to TheBigPodcastWithShaq@gmail.com. Shaquille O'Neal recaps an unbelievable party at Super Bowl 53 here in Atlanta, as John, Rob and B-Dog crashed Shaq's Funhouse which was total chaos. We also get the big man's thoughts on Tom Brady and the Patriots epic sixth Super Bowl victory. Throughout the week we also had comedian Craig Gass stop by the studio, and Shaq had him prank calling everyone on his staff as Al Pacino and Tracey Morgan! We also get into all the big NBA news of the past week, including the Porzingis trade and Anthony Davis wanting out of New Orleans. And after a Patriots win, B-Dog has a ridiculous Super Bowl bet to pay off to Shaq, but Shaq has to pay one off to Jimmy Fallon as well. Of course we get Borderline, and play a round of our favorite game Black Crime or White Crime. 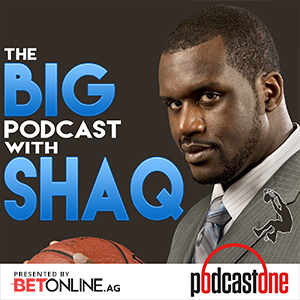 Get into the mix on Twitter by following @Shaqcast or using #Shaqcast - follow The Big Podcast with Shaq on Instagram and Facebook - or email your best Borderlines, questions and stories to TheBigPodcastWithShaq@gmail.com.